Saving energy at your home is not just good for your pocket book, it’s also good for the environment! We have compiled a list of a few energy saving tips for you at your home. Turn off electronics when you aren’t using them. Keep items away from vents to keep from blocking them. Plant a tree to provide future shade for your home. You can recycle cans, paper, glass, and plastic. Replace conventional light bulbs with Compact Fluorescent Light Bulbs. Keep doors and windows shut tightly when the heat or air conditioner is on. Keep warm during the winter by wearing extra layers instead of turning up the heat. These tips are great for kids too! Print out this great guide to put on your refrigerator to remind your children how to save energy around the house! 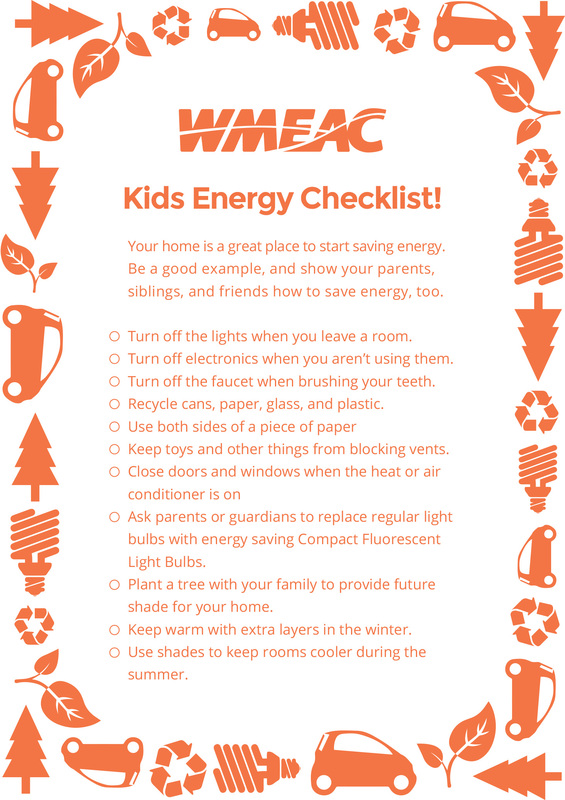 Download WMEAC’s Kids Save Energy Guide! Interested in learning more about saving energy at your home?